You must be a member of the Tallinn Sports Group to attend this activity. Would you like to join this group? 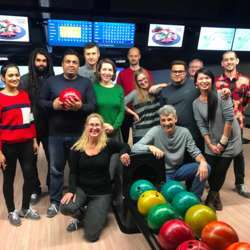 Come join your InterNations friends for our monthly bowling night! We have 2 lanes. All levels welcome! Cost is 5€ per bowler (shoes included) Best Bowler of the night gets his/her name added to the InterNations Bowling Trophy.